Explore the spectacular Pororari River Gorge with dramatic limestone cliffs, beech forest and glades of subtropical nīkau palms. 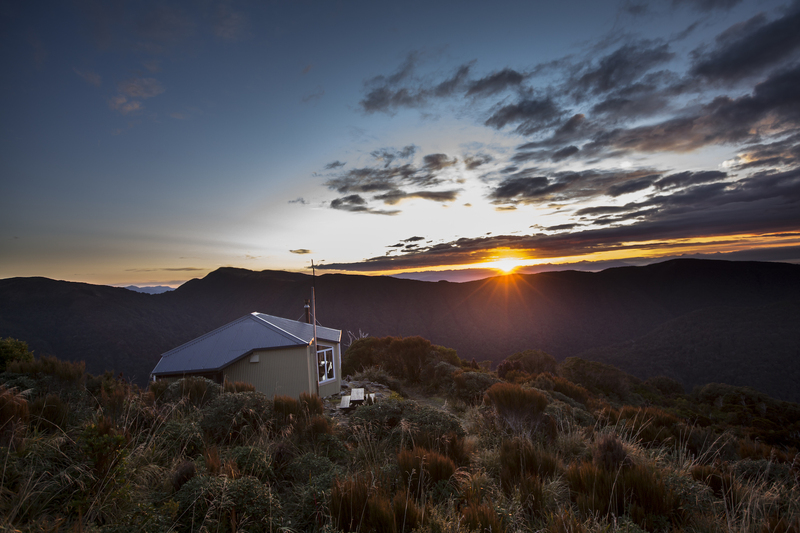 Sit back and enjoy in incredible Tasman Sea sunsets from the Moonlight Tops Hut. Explore the area’s unique mining history - gold on the Croesus Track, coal in Pike Stream, and uranium prospecting in the Pororari River. Enjoy expansive views from the top of the towering escarpment in the Pike Basin. There are two 20-bunks huts that must be booked in advance year round. Huts have bunks, mattresses, heating, gas cook tops, toilets and a water supply. A DOC ranger may be present. Huts do not provide food, cooking utensils or showers. The track begins at its southern end at Smoke-ho car park near Blackball, about a 45-minute drive from Greymouth. Beginning on the existing Croesus Track, with remnants of the area’s goldmining history, the track ascends through beech and podocarp forest before crossing alpine scrub and tussock. You will be rewarded with expansive views of Grey River/Māwheranui to the east and the Tasman Sea to the west. Moonlight Tops Hut (to be built) provides spectacular views across the Punakaiki River headwaters to the Pike Stream escarpment and north to the Paparoa National Park. Open tops give way to alpine forest stunted by the harsh environment. Along this section of the track you meet the junction of the Pike ridge with the main Paparoa Range. Here the Pike29 Memorial Track to the Pike River Mine site begins. Beyond the junction, the Paparoa Track winds along the top of the escarpment where the landscape is strikingly dramatic with sheer drops and stunning views down the Pike Stream in the east, stretching west to Punakaiki and north-west to Westport. About halfway to Pororari Hut (to be built), you descend from the escarpment to walk through ancient podocarp forest under towering cliffs. The track then follows the spine of the Tindale ridge to Pororari Hut. As you traverse the ridge, look north to see the Lone Hand, a curious and gnarled outcrop of bedrock on the north side of the Pororari River. Paparoa Track then descends and follow the upper Pororari River valley, just above the river itself, until it joins an old pack track built to establish settlement in the upper valley. The track sidles a spectacular gorge and descend towards the coast through beech forest interspersed with northern rātā. From here you will catch glimpses of the lower Pororari River Gorge. At the junction with the historic Inland Pack Track, walkers and mountain bikers diverge: walkers follow the Pororari River Track which sidles the lower gorge with its striking limestone cliffs; mountain bikers descend into the Punakaiki River valley, ending at Waikori Road car park. Both pass through lush rainforest with serene glades of nīkau palms. The nearest towns are Blackball, Greymouth and Punakaiki. DOC works in partnership with the Paparoa Wildlife Trust in the south-east ranges bordering the Paparoa National Park. Through this partnership, the Paparoa Wildlife Trust maintains a trapping network that effectively controls between 10,000 and 15,000 hectares of land. This programme, in conjunction with the 12.5-hectare pest-proof kiwi crèche on the Atarau plains and the Paparoa great spotted kiwi/roroa recovery project, has delivered significant gains for kiwi. New Zealand’s newest Great Walk is due to open in 2019 but for those salivating over the idea of visiting the Paparoa Range, there’s an existing network of nearby tracks to experience.